Farc rebels in Colombia say they have handed over 30% of their arms to United Nations (UN) monitors, under the terms of last year's peace agreement. They will hand over another third next Wednesday, with the remainder due to be surrendered in a fortnight's time. The weapons are to be stored at 26 locations around the country. After five decades of war and years of negotiations, the government and the country's biggest rebel group sealed the agreement last year. 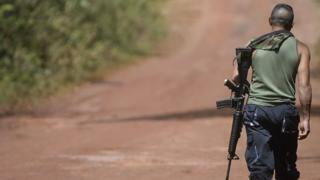 There are 7,000 rifles and pistols to be handed over before the Farc - the Revolutionary Armed Forces of Colombia - can become a political party. Farc leader Rodrigo Londoño Echeverri, who is better known as Timochenko, announced the handover on social media on Wednesday. Government sources and the UN confirmed that the weapons had been surrendered. Farc rebels have until 20 June to hand over all their weapons - a deadline that was extended from an original date of 30 May. This has been one of the most awaited moments of the implementation of the peace process in Colombia. So far no photograph or video of a fighter handing over a weapon to a UN mission member has been seen. It is uncertain if there will be such picture. Still, with the verification of the UN, the disarmament of the largest guerrilla group in Colombia is finally taking place. They need to get it over and done with so they can focus on the next step for their organisation: entering Colombia's political life, as civilians, with their own political party that they plan to launch by August this year. How will they fare and how much support will they have from the Colombian people? Many do not like the Farc, even without arms. But most will value the fact that they will not use them any more to push for their political goals. The decades-long conflict between rebel groups, state forces, paramilitaries and drug gangs killed hundreds of thousands of people and displaced more than seven million. The peace deal was initially rejected in a referendum, then reworked and implemented. Since it came in to force the national army has been granted access to areas that were once occupied by the Farc and former rebels have been rejoining civilian life. But in a move that threatened the process, a rebel was arrested in contravention of the deal's terms. President Juan Manuel Santos put the arrest down to "confusion" and the man was released. For his efforts to reach peace with the Farc, Mr Santos was awarded last year's Nobel Peace Prize.